May will be a busy month for Rusty Wallace, Penske Racing South and the Miller Lite Racing team with Millers run for "President of Beers." Tying into the campaign touting Miller Lites great taste and less filling benefits, Wallace will debut a red, white and blue No. 2 "Vote Miller" Dodge during the 500-mile NASCAR NEXTEL Cup Series event at California Speedway on May 2, 2004. Action Performance Companies Inc., the leader in licensed motorsports merchandise, will issue the official die-cast replicas of Wallaces No. 2 Miller Lite/Vote Miller Dodge. 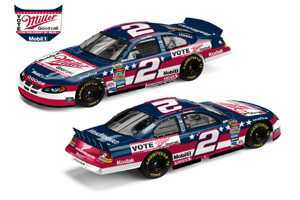 The limited edition collectibles will reflect the actual Vote Miller for President of Beers paint scheme as seen on the racetrack. The No. 2 Miller Lite/Vote Miller Dodge also will compete in front of NASCAR�s "hometown" crowd at Lowes� Motor Speedway in Concord, N.C. during the inaugural NASCAR NEXTEL All-Star Challenge on May 22 and the Coca-Cola 600 on May 30, 2004, which coincides with the annual Speed Street event. "Now in his 15th season behind the wheel of Miller-backed stock cars, Rusty Wallace is an embodiment of Miller and its Miller Lite brand," said Fred Wagenhals, Actions chairman, president and CEO. "When there is a special No. 2 Miller Lite race car on the track, Rustys fans always look forward to a great paint scheme - and an even more memorable die-cast." Action Performance will produce die-cast replicas of the No. 2 Miller Lite/Vote Miller 2004 Dodge stock car in a variety of collector scales and packaging styles. The collectibles will be available through Actions standard distribution channels, including the 17-member Action Racing Collectables distributor network and Racing Collectables Club of America. To locate an ARC distributor, please call 1-800-411-8404. To join RCCA, call 1-800-952-0708 or visit www.goracing.com.